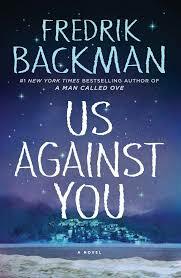 Us Against You by Fredrik Backman follows up on his excellent novel Beartown and continues the tale of a small Swedish town, it's youth hockey team, and the people who play on it and whose lives are influenced by it, with the main high school-aged characters Maya, Ana, Benji, Amat, Bobo, and Vidar. The section with Vidar's tough older brother Teemu going into elementary school-aged Alicia’s hardscrabble house and saying that her hockey gear would be paid for by the Pack for as long as she wanted to play, and she wouldn’t be hurt anymore. How a character was said to "die the same way they lived, instantly" and the reaction to grief, with "Kira hands him the brush without a word. He washes, she dries." About the support of Amat by others from his neighborhood, The Hollow, "he had no team. So they gave him an army." About the Pack's support of Ana, "a section of the audience stands up, as if on command. They don’t shout out, but they’re wearing black jackets, and they all put one hand very briefly on their hearts when she looks at them. 'Who are they? ', the ref asks in surprise. 'Those are my brothers and sisters. They stand tall if I stand tall.'" Ana saying to Benji, "Don’t let the bastards see you cry." The book's final sentence of "it’s a simple game if you strip away all the crap surrounding it and just keep the things that made us love it in the first place. Everybody gets a stick. Two nets. Two teams. Us against you."